Joanne Bland "Selma: Turning Point for the Church"
Left, Joanne Bland was an 11-year-old member of the Student Non-violent Coordinating Committee and attended almost all of the mass meetings leading up to the Selma march. She was there on Bloody Sunday, helped protect white Northerners from Kluxers and started and finished the final voting rights march. She now conducts tours and tell her stories for civic and school groups wanting to reconnect with the history. Below  "A succession of marchers carried American flags from Selma to Montgomery. The flags contrasted with the Confederate banners emblazoned on the jackets and helmets of federalized Alabama National Guardsmen along U.S. Highway 80." Joanne was there. Joanne Bland was 11 years old in 1965, but she was already a trained and seasoned marcher for SNCC  "I'm a Student Nonviolent Coordinating Committee person! I was proud of my organization! I had gone to jail. I was a SNICK! I was a warrior!" 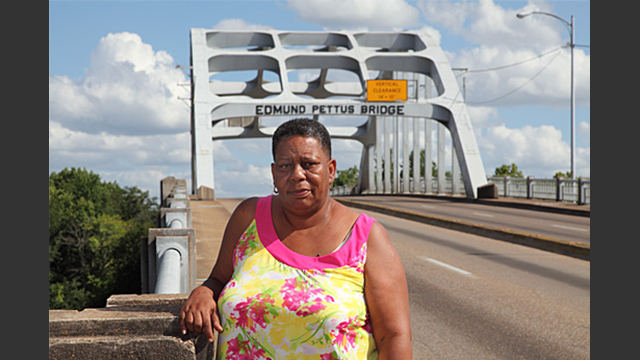 She was about half-way back on the Edmund Pettus Bridge in Selma when the state troopers attacked the marchers on Bloody Sunday. "I knew the procedure," she says. Normally, the leaders would ask permission to pass, it would be denied and the group would kneel down for prayer. "Suddenly I heard gun shots and screams. I thought they were killing the people down front. [The 'gunshots' were actually tear gas being fired at the crowd.] But before we could turn to run, they had come in from the sides the back and the front. There was nowhere to go. They were just beating people." At that time, Ms. Bland became a frightened kid again. "You couldn't outrun the cops on horses," she says. "I remember seeing this horse and this lady. I don't know if he hit her and she fell. But I can still hear the sound that her head made when it hit that pavement. Sickening." Eventually, most of the marchers made it back to a Brown Chapel in the middle of a black housing project. All through the night, bullets were fired into the church and the apartments. In the morning, police barricaded the project. Black leaders appealed for Northern church people to come down to Selma, thinking that their presence would bring press attention and lessen the potential for violence. So it became a joke in the project. You didn't lock the door until a white person was in the house. [She laughs.]" See a 360° full circle panorama of Joanne Bland at the re-enactment of the crossing of the Edmund Pettus Bridge here. Please consider donating through Pay Pal.